In this article, we have compiled a list of 5 best YouTube PHP script which is used to embed and import YouTube videos directly on your website. These YouTube PHP scripts can be used for creating an online music website. Your users can listen to music online by just writing the name of the song. Here the videos can be instantly imported from YouTube, as these scripts help you to integrate YouTube application with your website. The best part of using these cleanly coded scripts is you and your users are allowed to share the videos on various social networking sites such as Facebook, Twitter and more. It allows you to import videos on the basis of tag or keyword. 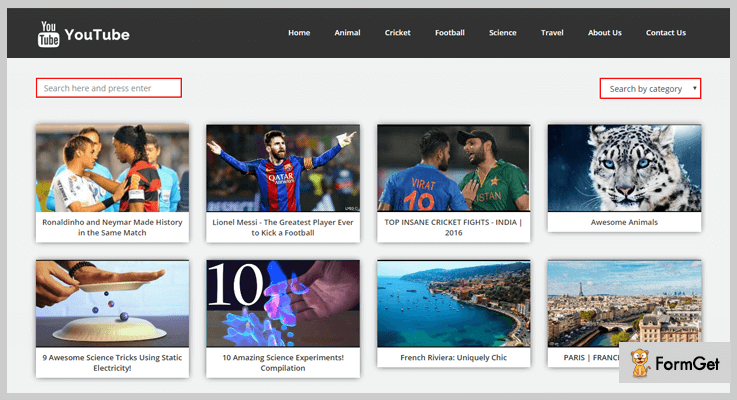 Further, you can categorize the videos on the basis of different genres which will help your users to find videos in just a few clicks. Login and registration form along with HTML5 & PHP validation. Let us discuss each YouTube PHP script in detail. 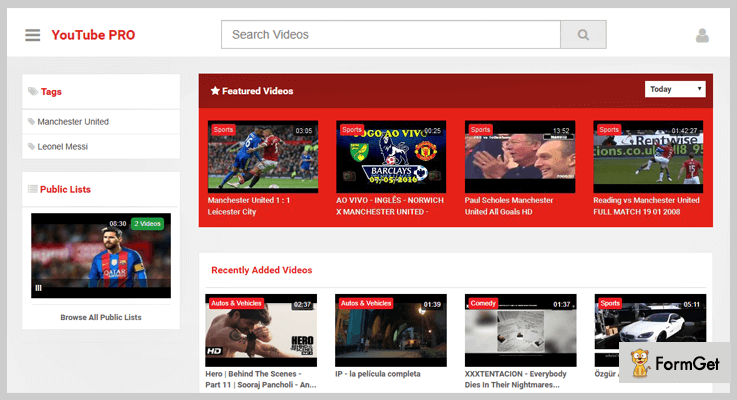 You can create your own YouTube videos website easily with the help of this effective YouTube PHP script. The script allows you to embed videos from YouTube either manually by just pasting the link of videos or it can also be done automatically with the help of this YouTube PHP script. The script has secure code which is protected against SQL Injection. Further, it supports AJAX techniques which make your browsing work faster. Moreover, it allows your users to create their own lists on your site to play it or watch it later. You can create a membership system on your website, where users are allowed to signup, login, and find videos on your site. Also, it has an option for forgetting & resetting the password. It has an inbuilt rating system where users can rate your videos. Further, it also helps you to see the stats of the videos such as likes, dislikes and more. The script is integrated with Disqus or Facebook comments. Also, it allows your users to share the videos on various social networking sites such as Facebook, Twitter etc. YouTube PHP script has an inbuilt advertisements space. So, you can place various ads from your sponsors in a well-arranged manner. Grab this useful YouTube PHP script at $19 with 6 months support. It’s extended plan will cost you $95 where you will get regular updates and quality checked by Envato. 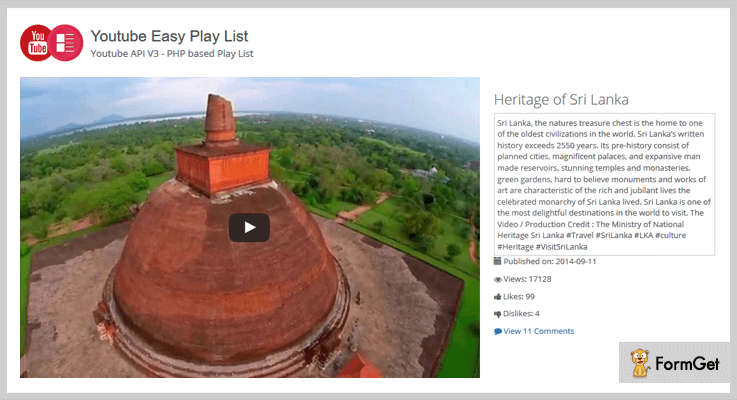 This PHP script helps you to manage your YouTube playlist in a well-arranged manner. You can import any videos from YouTube on the homepage of your website. 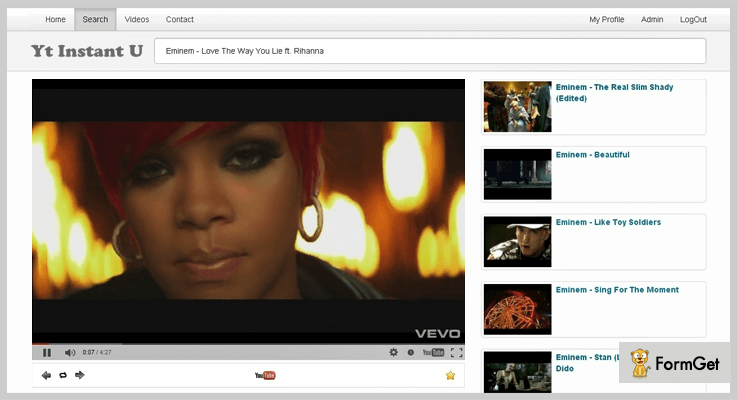 Also, you can create the YouTube playlist on your web page in just a few minutes. Further, it helps you to view comments which are done by your visitors on the videos present on your site. It can showcase you complete statistics of playing video such as a number of likes, dislikes, share and more. Also, it allows you to see the name of commented user and you have the power to enable or disable the comments according to your choice. Using this YouTube PHP script, you can view the next and previous pages within the playlist as well as videos within the page. YouTube PHP script uses an AJAX command to view comments and get back to info at the same time. Easy to install script comes with good documentation and complete user guide. Further, it has a bootstrap based responsive design so, the videos can be seen easily on every device. Regular License – This plan cost you $11 with regular updates and 6 months support. Extended License – Buy this plan at $55 where you will get quality checked by Envato. It is an OOP based PHP script which is used to make a list of YouTube links on your site which further converted into a video playlist. In addition to this, it is a highly customizable script so, you can make any change in the script according to your requirement. 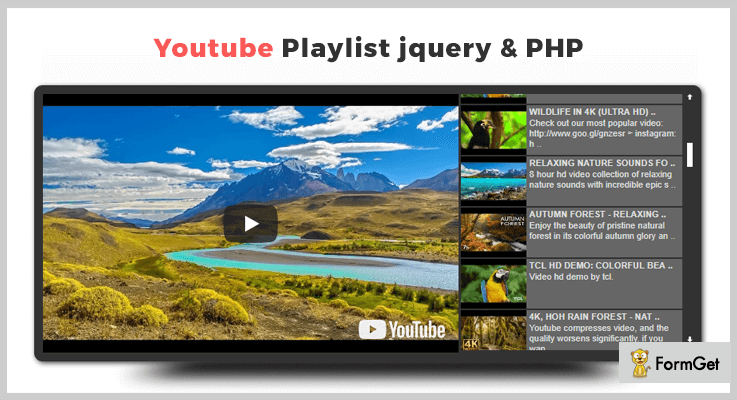 This YouTube PHP script helps you to make video playlist on your website with keywords, user channel and more. Also, you can make a list by regular YouTube playlist. This YouTube PHP script is SEO optimized. So, the titles and descriptions of the videos are placed into the source of the page which can be easily retrieved by the search engines in no time. You can share the YouTube videos on various social networking sites such as Facebook, Twitter and more in just a few clicks. This will make your site more user-friendly. It has a slideshow feature through which the autoplay next video option is being enabled. This helps in playing the next video in the playlist automatically which saves your as well as your users time. Buy this YouTube PHP script at a reasonable price of $8 with regular updates and 6 months support system. It’s extended license is available at $40 along with quality checked by Envato. This is a CMS script which is used for creating and managing YouTube videos on your business website. You can make a list of your favorite YouTube videos and categorize them according to your choice. Also, you can upload the videos online in a fraction of time. You can create a professional video channel website along with useful features like secured coding against SQL injection, social sharing button for each video and more. Moreover, for every video posted on your website page, you can set the SEO metadata according to your choice. Admin is allowed to place videos on any page of the website. Further, in all pages, admin level security is there where you can check invalid page URL before submission. The website owner can see the statistics of data like the number of likes, dislikes, share videos on the dashboard. You and your users can easily search videos with the help of 2 searching options present on the homepage. In the first section, you can search for videos by placing the name or URL, however, in the second section, the filtration can be done on the basis of categories. This YouTube PHP script is available at a reasonable price of $22 with a 6-month support. Further, you can extend the support up to a year by paying $6.38. The extended license is available at $125 with quality checked by Envato and regular updates. It is a unique yet powerful YouTube PHP script. One can create an online music player website, where your visitors listen to online music in audio form as well as in video format. Further, you can place a search bar on your site, where your users are allowed to find any song and listen to it online. The script helps you to place audios as well as videos on your site. In addition to this, it has an instant YouTube search option by which whenever a user finds something, the YouTube videos will be played for them. It has a login & registration system with HTML5 validation. Further, after registration only, the visitors are allowed to search videos/music and listen to it online. There is an automatic next video play button, also, it has an option of loop player through which the same video will be played various time. This YouTube PHP script helps you to collect leads with the help of a contact form which you can place on your website in just a few clicks. The regular license cost you $9 with quality checked by Envato and 6 months support. Buy the extended license at $45, for all the advanced features and future updates. In the above article, we have discussed the 5 best selling YouTube PHP script with all their functionalities description. We hope that you have got the script of your choice. Still, if you have any queries, you can comment it in the comment section below. Stay connected for upcoming PHP scripts.